Spinal stenosis is also called spinal canal stenosis, is a narrowing of the spinal canal in which the spinal cord sits, which can cause pain and weakness in your arms or legs. The narrowing can put pressure or compress on the spinal cord and the spinal nerve roots, leading to symptoms such as pain, numbness, and weakness. Spinal stenosis occurs most often in the lower back and the neck. Some people with spinal stenosis may not have symptoms. Others may experience pain, tingling, numbness and muscle weakness. Symptoms can worsen over time. Spinal stenosis is often caused by arthritis or disc prolapse. As well, some people are born with a congenitally narrowed spinal canal. The spinal cord can be directly compressed by osteophytic bones and ligamentous hypertrophy. Compression of local vascular structures can lead to ischemia of the spinal cord from arterial insufficiency and venous stasis. A herniated disk can exert repeated local trauma to the spinal cord or nerve root during repetitive flexion and extension movements, especially in the unstable spine with multiple levels of subluxations. Spinal stenosis most commonly is caused by degenerative osteoarthritis of the spine or spondylosis and occurs most frequently at the L4 to L5 level, followed by L5 through S1 and L3 to L4. Additional risk factors include obesity or a family history of this condition. Other factors such as disc protrusion or bulging (for example, caused by progressive disc degeneration with aging or trauma), loss of disc height, facet joint arthropathy, osteophyte formation, or ligamentum flavum hypertrophy can all lead to encroachment on and narrowing of the central canal and neural foramina. Spondylolisthesis, the translation of one vertebral body anteriorly or posteriorly relative to an adjacent vertebral body, may also exacerbate spinal canal narrowing. Additional acquired causes of spinal stenosis include space-occupying lesions such as synovial or neural cysts, neoplasms, or lipomas; traumatic or postoperative changes such as fibrosis; and skeletal diseases such as ankylosing spondylitis, rheumatoid arthritis, or Paget disease. Congenital or developmental causes of spinal stenosis include dwarfism namely achondroplasia, Morquio’s syndrome, and spinal dysraphism such as spina bifida, spondylolisthesis, and myelomeningocele. The upper neck (cervical) and lower back (lumbar) areas most frequently are affected, although the thoracic spine also can be compressed most frequently by a disk herniation. Three different anatomic sites in the spine can be affected by spinal stenosis. First, the central canal, which houses the spinal cord, can be narrowed in an anterior-posterior dimension, leading to compression of neural elements and reduction of blood supply to the spinal cord in the cervical area and the cauda equina in the lumbar area 1). Secondly, the neural foramen, which are openings through which the nerve roots exit the spinal cord, can be compressed as a result of disk herniation, hypertrophy of the facet joints and ligaments, or unstable slippage of one vertebral body relative to the level below 2). Lastly, the lateral recess, which is seen in the lumbar spine only and is defined as the area long the pedicle that a nerve root enters just before its exit through the neural foramen, can be compressed from a facet joint hypertrophy 3). Depending on the level of the spine affected, each type of compression can lead to different symptoms that warrant a particular treatment modality. See your doctor if you have symptoms of spinal stenosis. Lumbar stenosis. Lumbar spinal stenosis is where the spinal canal narrows in the part of the spine in your lower back. This may cause pain or weakness in your legs. Lumbar spinal stenosis is the most common form of spinal stenosis. The prevalence of acquired lumbar spinal stenosis was 19.4%, for population aged between 60–69 years. In a Japanese population-based study where subjects underwent a symptoms questionnaire to predict lumbar stenosis, it was found that incidence increased with age, with 1.7–2.2% between ages 40-49, and 10.3%–11.2% between ages 70 to 79 4). It is also a significant contributor to spinal surgery in the US, 5.9 per 100 patients progressed to lumbar fusion within 1 year from the time of diagnosis of lumbar degeneration 5). Cervical stenosis. Cervical spinal stenosis is where the spinal canal narrows in the part of the spine in your neck, causing weakness or numbness in your arms and legs. Lumbar spinal stenosis is where the spinal canal narrows in your lower back. It refers to a narrowing in the vertebra, in the areas of the central canal, lateral recess or the neural foramen. A narrowed spinal canal means that there is not enough space for the nerves and blood vessels. You may have difficulty walking and leg pain. Lumbar spinal stenosis is a common source of leg and back pain 6). Despite its prevalence, currently, there is no universally accepted definition of lumbar spinal stenosis, and there is also a lack of generally accepted radiologic diagnostic criteria 7). Lumbar spinal stenosis is a significant cause of disability in the elderly, and it is the most significant cause of spinal surgery in patients over 65 years of age 8). The causes of neurologic symptoms of lumbar spinal stenosis have been thought to originate from the compression and ischemia of nerve roots. Nerve root compression can originate from direct mechanical compression or increased intrathecal pressure due to the narrowing of the canal. Inflammation of nerve roots is also a plausible but less likely mechanism of neurologic symptoms in lumbar spinal stenosis 9). Degenerative spondylosis is a significant cause of lumbar spinal stenosis. With aging, wear-and-tear changes and traumas, amongst other factors, the intervertebral discs can degenerate and protrude posteriorly, causing increased loading of the posterior elements of the vertebrae. This can lead to posterior vertebral osteophyte formation (uncinate spurs), facet hypertrophy, synovial facet cysts, and ligamentum flavum hypertrophy, which in turn will cause spinal stenosis. Degenerative spondylolisthesis is another cause of lumbar spinal stenosis. When degenerative changes of the spine occur, the pars interarticularis can be fractured, and the resulting instability can lead to forward translation of the vertebra. Sufficient anterior slippage of one vertebra on top of the next vertebral segment (most commonly L4-on-L5) can narrow the spinal canal, leading to stenosis. Other acquired conditions, although rarer than the aforementioned conditions, should also be considered by the clinician. These include space-occupying lesions, post-surgical fibrosis, and rheumatologic conditions as well as other skeletal diseases such as ankylosing spondylitis or diffuse idiopathic skeletal hyperostosis 10). Even more rarely, lumbar spinal stenosis may be secondary to congenital causes such as achondroplasia, which can lead to short pedicles with medially placed facets. Classically, lumbar spinal stenosis presents as pain exacerbated by prolonged ambulation, standing, and with lumbar extension, and is relieved by forward flexion and rest. Neurogenic claudication is an important feature of lumbar spinal stenosis. Symptoms are typically bilateral, but usually asymmetric. Low back pain, numbness, and tingling are present in a majority of patients. Numbness and tingling in lumbar spinal stenosis involve usually the entire leg, and rarely involves only a single nerve root distribution 11). Approximately 43 percent of the patients experience weakness. Patients may also report walking upstairs being easier than walking downstairs, as the back is forward flexed with stairs climbing. If patients present with new-onset bowel or bladder dysfunction, saddle anesthesia, bilateral lower extremity weakness and/ or increased lower extremity, the patient may have developed cauda equina or conus medullaris syndromes. A thorough physical examination should be performed on patients with suspected lumbar spinal stenosis. Pain with passive and active lumbar extension can be elicited. Although it is possible that patients can have superimposed lumbar radiculopathy, it should be noted that neurologic examinations on patients with lumbar spinal stenosis are typically normal, and only 10 percent of patients would present with a positive straight leg raise test 12). Pedal pulses should also be checked during physical exam as vascular claudication can present similarly. Stenosis in the lumbar spine can lead to neurogenic claudication, myeloradiculopathic symptoms, sensory disturbances, motor weakness, and pathologic reflexes. Disk herniation is most common at the L4-5 and L5-S1 levels. A herniated disk at L5-S1 can lead to plantarflexion weakness, decrease sensation in the lateral foot, and cause pain in the posterior leg. A disk herniation at L4-5 can lead to a foot drop and numbness in the large toe web and dorsal aspect of the foot. Lastly, an L3-4 disk herniation can lead to knee extension weakness, numbness in the medial foot, and pain in the anterior thigh. Management for lumbar spinal stenosis is aimed at reducing symptoms and improving functional status. Conservative treatment is the first-line treatment for this condition. Conservative treatment options include physical therapy, oral anti-inflammatory medications, and epidural steroid injections. Although there is no standardized physical therapy regimen, many therapists focus on stretching and strengthening of the core muscles, which can lead to correction of posture and improved symptom 13). Although there are short-term benefits, lumbar epidural steroid injections have not been shown to have long-term improvement of pain and disability in lumbar spinal stenosis patients, and there is no statistical difference between epidural injections with anesthetics alone versus a mixture of anesthetics with corticosteroids 14). Lumbar corsets may also be trialed for temporary relief of pain 15). Barring emergencies such as cauda equina syndrome, surgical management for lumbar spinal stenosis is usually elective, as the goal of treatment is to improve function, rather than preventing neurologic impairment. The most frequently performed surgical procedure is laminectomy. A randomized trial has shown that there is a greater improvement of symptoms in patients undergoing laminectomy compared to the non-surgical group 16), however, the symptom improvement between the surgical and non-surgical groups diminish over time. Laminectomy with fusion is typically reserved for patients with concurrent spondylolisthesis to provide further stability. A less invasive approach is interspinous spacer implantation, this procedure is appropriate for patients with intermittent claudication symptoms without spondylolisthesis. Lumbar spinal stenosis is a significant cause of pain and disability, and approximately half the patients have involvement of other spinal segments over time; however, it typically follows a benign course. In one cohort study, 30% of patients electing to manage lumbar spinal stenosis with non-surgical procedures eventually requested for surgical management, and approximately 19% of patients who had an initial surgery eventually underwent a repeat surgery 17). Stenosis in the cervical spinal can lead to radicular symptoms due to nerve root compression and myelopathy due to spinal cord compression. Radicular symptoms are dependent on the level affected, with the nerve root affected being the one that exists at that level. For example, a C5-6 disk herniation leads to a C6 radiculopathy. C6-7 disk herniation is the most common, leading to a wrist drop and paresthesia in the 2 and three fingers. C5-6 disk herniation is the next common, resulting in weakness in forearm flexion and paresthesia in the thumb and radial forearm. C7-T1 disk herniation can lead to weakness in the hand intrinsics muscles and numbness in the 4 and five digits. Lastly, a C4-5 disk herniation can lead to deltoid weakness and shoulder paresthesia. Patients also can experience pain and paresthesia in the head, neck, and shoulder. Cervical spondylotic myelopathy can be seen in patients with greater than 30% spinal narrowing, leading to gait disturbance, lower extremity weakness, and ataxia. Some people are born with a small spinal canal. But most spinal stenosis occurs when something happens to narrow the open space within the spine. Wear and tear damage from osteoarthritis on your spinal bones can prompt the formation of bone spurs, which can grow into the spinal canal. Paget’s disease, a bone disease that usually affects adults, also can cause bone overgrowth in the spine. The soft cushions that act as shock absorbers between your vertebrae tend to dry out with age. Cracks in a disk’s exterior may allow some of the soft inner material to escape and press on the spinal cord or nerves. The tough cords that help hold the bones of your spine together can become stiff and thickened over time. These thickened ligaments can bulge into the spinal canal. Abnormal growths can form inside the spinal cord, within the membranes that cover the spinal cord or in the space between the spinal cord and vertebrae. These are uncommon and identifiable on spine imaging with an MRI or CT. Car accidents and other trauma can cause dislocations or fractures of one or more vertebrae. Displaced bone from a spinal fracture may damage the contents of the spinal canal. Swelling of nearby tissue immediately after back surgery also can put pressure on the spinal cord or nerves. In the cervical spine, stenosis can be caused by a combination of factors. Some individuals can have a congenitally narrowed spinal canal that is exacerbated by pathologic factors. Disk herniation together with the formation of osteophytic spurs, hypertrophy of the articular facets and ligamentum flavum, and ossification of posterior longitudinal ligaments can lead to central and foraminal stenosis. Structural factors such as subluxation from disk and facet joint degeneration and changes in the normal lordotic curvatures of the spine can lead to spinal compression. In the thoracic spine, disk herniation either from degenerative causes or trauma can lead to stenosis at specific levels. In the lumbar spine, hypertrophy of the facet joints and ligamentum flavum in the setting of disk herniation or spondylolisthesis can lead to worsening stenosis. Spondylolisthesis in the lumbar spine, defined as anterior subluxation of one vertebral body on top of another, is seen most commonly at L5 on S1 and L4 on L5. This can lead to compression of the nerve that exits below the pedicle of the anteriorly subluxed vertebra and results in neurogenic claudication. Risk factors that lead to the development of spinal stenosis are multifactorial. There is a genetic influence as demonstrated in the study of twins. Cumulative trauma can lead to the progression of the disease. Osteoporosis can be a contributing factor. Cigarette smoking in several epidemiological studies has been shown to lead to back pain and degenerative spinal diseases. In the lumbar spine, obesity and loss of muscle tone can lead to stresses and dependence on the bony and ligamentous structures of the spine for structural support. Many people have evidence of spinal stenosis on an MRI or CT scan but may not have symptoms. When they do occur, they often start gradually and worsen over time. Spinal stenosis symptoms often get worse slowly over time. 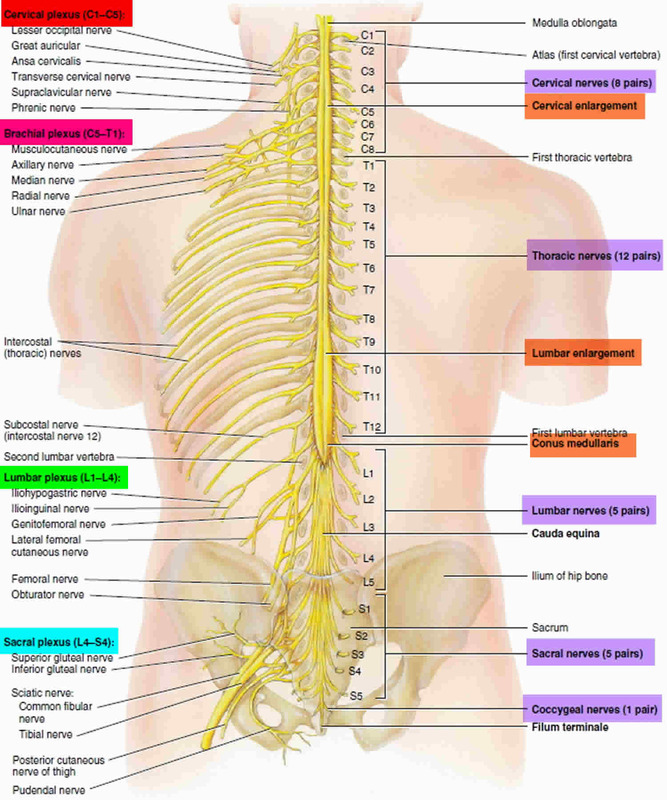 Symptoms vary depending on the location of the spinal stenosis and which nerves are affected. Most often, symptoms will be on one side of the body, but may involve both legs. To diagnose spinal stenosis, your doctor may ask you about signs and symptoms, discuss your medical history, and conduct a physical examination, with a focus on sensation, motor strength, reflexes, and gait. He or she may order several imaging tests to help pinpoint the cause of your signs and symptoms. Your doctor will also move your legs in different positions, including bending and straightening your knees. This is to check your strength and ability to move. A brain and nervous system (neurologic) examination helps confirm leg weakness and loss of sensation in the legs. X-ray of the spine. An X-ray of your back can reveal bony changes, such as bone spurs that may be narrowing the space within the spinal canal. Each X-ray involves a small exposure to radiation. Electromyography (EMG). Electromyography (EMG) is a test that checks the health of the muscles and the nerves that control the muscles. Your health care provider inserts a very thin needle electrode through the skin into the muscle. The electrode on the needle picks up the electrical activity given off by your muscles. This activity appears on a nearby monitor and may be heard through a speaker. After placement of the electrodes, you may be asked to contract the muscle. For example, by bending your arm. The electrical activity seen on the monitor provides information about your muscle’s ability to respond when the nerves to your muscles are stimulated. A nerve conduction velocity test is almost always performed during the same visit as an EMG. The velocity test is done to see how fast electrical signals move through a nerve. Diagnosis can be made through imaging with extended release x-ray, CT, and MRI. With the availability of MRI, a plain radiograph is of limited value although dynamic views in flexion and extension modes can demonstrate dynamic instability or spondylolisthesis. CT can help differentiate calcified disks or bone osteophytes from “soft disks,” differentiate ossification of the posterior longitudinal ligament from a thickened posterior longitudinal ligament and detect bone fractures or lytic lesions. MRI is the gold standard; it is able to show intrinsic cord abnormalities, the degree of spinal stenosis, and differentiate other conditions such as tumors, hematoma, or infection. If a patient has a pacemaker and cannot obtain an MRI, a CT myelogram can be performed to identify the level and degree of stenosis. Your doctor and other health professionals will help you manage your pain and keep you as active as possible. Your doctor may refer you for physical therapy. The physical therapist will teach you stretches and exercises that make your back muscles stronger. An epidural spinal injection, which involves injecting medicine directly into the space around your spinal nerves or spinal cord. In patients who suffer from cervical stenosis without myelopathy, conservative management with bracing, rest, or anti-inflammatory medications initially can be employed 18). For those with myelopathy, surgical decompression can provide some relief from pain and sensory loss and can prevent the exacerbation of myelopathy. Depending on the levels involved and the pathology, an anterior or posterior decompression and fusion can be employed to relieve the compression and stabilize the spine. In the lumbar spine, initial management of back pain can be done with NSAIDs (Nonsteroidal Anti-inflammatory Drugs) and physical therapy followed by interventional pain management strategies for persistent back pain. When conservative management is inadequate, or the patient develops progressive myelopathy, neurologic deficits, or spinal instability, surgical decompression and fusion are recommended. Depending on the nature of the pathology, a variety of approaches, including anterior, lateral, or posterior can be employed to restore lumbar lordosis, decompress the stenosis, and promote fusion. Assigning patients to six weeks of physical therapy is as effective as initially sending them for decompression surgery, with fewer complications, even in patients who have a strong preference for surgery 19). A trial of six weeks of physical therapy makes sense for many patients with confirmed spinal stenosis before getting out the scalpel 20). The investigators enrolled 169 patients (average age: 66 to 69 years) with image-confirmed lumbar stenosis who consented to surgery 21). This approach to enrollment eliminated many patients, presumably those with milder symptoms. The patients were randomly assigned (allocation concealed) to surgery or physical therapy. The decompression surgery was the typical procedure used in research and practice. Physical therapy, administered twice weekly for six weeks, consisted of lumbar flexion exercises and conditioning to identify the issues of strength and flexibility identified at enrollment. Analysis was by intention to treat, meaning that patients assigned to physical therapy were analyzed as being in that group even if they eventually received surgery, which 57% of them did over the two years of follow-up (most of them within the first 10 weeks of the study). Approximately 20% in each group sought additional physical therapy. Two years after identification, general quality of life (as measured by the 36-Item Short Form Health Survey, a typical measure of quality of life) improved equally in both groups, to an average score of 48 to 50 from a baseline of 26 to 28 out of a possible 100. Analyzing by actual treatment rather than by intention to treat yielded similar results, although the study may not have had enough power to find a difference if one existed. Pain, disability, and neurogenic symptoms improved similarly in both groups. Complications were common in the back surgery group, including the need for reoperation. Many patients were not returned to “normal” but continued to visit a back surgeon or primary care physician for back pain two years after the intervention. Applying hot or cold packs. Some symptoms of cervical spinal stenosis may be relieved by applying heat or ice to your neck. Talk with your doctor if you’re interested in these treatment options. You and your doctor can decide when you need to have surgery for these symptoms. The procedure is called percutaneous image-guided lumbar decompression (PILD). It has also been called minimally invasive lumbar decompression (MILD), but to avoid confusion with minimally invasive surgical procedures, doctors have adopted the term percutaneous image-guided lumbar decompression. Because percutaneous image-guided lumbar decompression is performed without general anesthesia, it may be an option for some people with high surgical risks from other medical problems. Surgery is performed when nerves branching out from the spine are being squashed, causing pain, weakness or numbness in the arms or in the buttocks or legs. Most people are advised to try other treatments first before resorting to surgery. This approach to surgery removes bone or lamina in a way that reduces the damage to nearby healthy tissue. This results in less need to do fusions. Regular exercise should help you to return to normal activities as soon as possible. Before you start exercising, ask the healthcare team or your doctor for advice. 4. ↵ Yabuki S, Fukumori N, Takegami M, Onishi Y, Otani K, Sekiguchi M, Wakita T, Kikuchi S, Fukuhara S, Konno S. Prevalence of lumbar spinal stenosis, using the diagnostic support tool, and correlated factors in Japan: a population-based study. J Orthop Sci. 2013 Nov;18(6):893-900. 7. ↵ Kalichman L, Cole R, Kim DH, Li L, Suri P, Guermazi A, Hunter DJ. Spinal stenosis prevalence and association with symptoms: the Framingham Study. Spine J. 2009 Jul;9(7):545-50. 8. ↵ Zaina F, Tomkins-Lane C, Carragee E, Negrini S. Surgical Versus Nonsurgical Treatment for Lumbar Spinal Stenosis. Spine. 2016 Jul 15;41(14):E857-68. 9. ↵ Jinkins JR. Gd-DTPA enhanced MR of the lumbar spinal canal in patients with claudication. J Comput Assist Tomogr. 1993 Jul-Aug;17(4):555-62. 10. ↵ Binder DK, Schmidt MH, Weinstein PR. Lumbar spinal stenosis. Semin Neurol. 2002 Jun;22(2):157-66. 11. ↵ Hall S, Bartleson JD, Onofrio BM, Baker HL, Okazaki H, O’Duffy JD. Lumbar spinal stenosis. Clinical features, diagnostic procedures, and results of surgical treatment in 68 patients. Ann. Intern. Med. 1985 Aug;103(2):271-5. 12. ↵ Katz JN, Dalgas M, Stucki G, Katz NP, Bayley J, Fossel AH, Chang LC, Lipson SJ. Degenerative lumbar spinal stenosis. Diagnostic value of the history and physical examination. Arthritis Rheum. 1995 Sep;38(9):1236-41. 15. ↵ Prateepavanich P, Thanapipatsiri S, Santisatisakul P, Somshevita P, Charoensak T. The effectiveness of lumbosacral corset in symptomatic degenerative lumbar spinal stenosis. J Med Assoc Thai. 2001 Apr;84(4):572-6. 16. ↵ Malmivaara A, Slätis P, Heliövaara M, Sainio P, Kinnunen H, Kankare J, Dalin-Hirvonen N, Seitsalo S, Herno A, Kortekangas P, Niinimäki T, Rönty H, Tallroth K, Turunen V, Knekt P, Härkänen T, Hurri H., Finnish Lumbar Spinal Research Group. Surgical or nonoperative treatment for lumbar spinal stenosis? A randomized controlled trial. Spine. 2007 Jan 01;32(1):1-8. 17. ↵ Chang Y, Singer DE, Wu YA, Keller RB, Atlas SJ. The effect of surgical and nonsurgical treatment on longitudinal outcomes of lumbar spinal stenosis over 10 years. J Am Geriatr Soc. 2005 May;53(5):785-92. 20, 21. ↵ Delitto A, Piva SR, Moore CG, et al. Surgery versus nonsurgical treatment of lumbar spinal stenosis: a randomized trial. Ann Intern Med. 2015; 162( 7): 465– 473.